San Francisco - and this should not come as a surprise - has quite a number of interesting wine bars. I have written about my favorite wine bars in San Francisco here: Schiller’s Favorite Wine Bars in San Francisco, USA. This posting focuses on one of them - Hotel Biron on Rose Street, behind Zuni Cafe. Hotel Biron isn't actually a hotel; it is a wine bar on Rose Street, behind Zuni Café. The place is small, with the ambiance of a well-stocked wine cellar. If you want to order something, you have to get up and go to the bar. Hotel Biron can be crowded in the post-work hours. After people drift home for the evening, the place opens up for a leg stretch and, of course, more wine. Biron serves up a very nice list of wines, by the glass and by the bottle. Hotel Boron’s wine list includes about 80 wines by the bottle, from all over the world, including the US (15), France (15), Germany and Austria (5) New Zealand, South Africa and Australia (5), Italy (20), Spain and Portugal (15), and Argentina and Chile (5). Price wise, many bottles are in the $30 to $60 range, with a 1985 Cantine del Castelllo Conti, Boca, for $150 the most expensive wine when I was there the last time. About half of the wines are also served by the glass, with most wines in the $12 to $15 range. A short menu that includes a cheese plate and an olive mix. You choose the cheeses from a small selection of cow's milk, goat and sheep varieties. New York Manhattan Wine Bars -- Bar Boulud, The Ten Bells, Terroir and Clo. My wife Annette and I visited Chateau Beausejour in Puisseguin in anticipation of the upcoming visit of the Weinfreundeskreis Hochheim in September. We did not taste any wines this time. In September, we will do a cellar and vineyard tour of Chateau Beausejour and will have lunch there. We will taste the 3 wines of Gerard Dupuy, who owns and makes the wines of Chateau Beausejour (AOC Puisseguin-St.Emilion), Chateau Langlais (AOC Puisseguin-St. Emilion) and Domaines de la Grande Courraye (Castillon Cotes de Bordeaux). All wines are bio wines, certified by Ecocert. Gerard Dupuy is not one of the 150 or so winemakers in Bordeaux, who produce a premium Bordeaux that sells en primeur for several hundreds or even thousands of Euros per bottle. No, Gerard is one of the other 18.000 winemakers that are not in the limelight and who have to struggle against the competition of wines from all over the world, including the New World. But Gerard’s wines are interesting and special for at least 2 reasons. He produces – like so many others – good value Petite Bordeaux wines and he makes them organically. Puisseguin-St. Emilion lies at the heart of the four satellite titles of the St. Emilion appellation on the right bank. The grape varieties permitted here are Merlot, Malbec, Cabernet Franc and Cabernet Sauvignon. Thus, Puisseguin-St. Emilion produces only red wines. Merlot is predominant, most often partnered with Cabernet Franc. To qualify for the Puisseguin-St. Emilion appellation, wines must contain a minimum of 11% alcohol and come from vineyards planted to a density of less than 5500 vines per hectare. Puisseguin-St.Emilion was granted AOC status in 1936. 753 hectares of vine planted areas belong to the appellation. The 4 St. Emilion satellites are St.Georges-Saint-Emilion, Montagne-St.Emilion, Lussac-St.Emilion and Puisseguin-St.Emilion itself – all located to the north of St.Emilion town. They are known as satellites because the area's more prestigious wine estates historically resented these supposedly inferior wines using the St.Emilion name. Gerard Dupuy told us that the clay and limestone soil of Chateau Beausejour is planted with Merlot (73%), Cabernet Franc (22%) and Cabernet Sauvignon (5%). All grapes are organically grown, certified by Ecocert. Gerard Dupuy: “The refusal of chemical treatments at our wineries dates back to their appearance on the market after 1945. We practice the total grass cover. This method allows regulating the ecosystem in a monoculture, while limiting soil erosion. In our vineyards, wild tulips thrive in the vineyard rows in the spring.” The combined vineyard area of Château Beauséjour and Château Langlais is 25 hectares. The average age of the vines is 40 years. The vineyards of Domaine de la Grande Courraye are in the Castillon Côtes de Bordeaux appellation. I did not ask Gerard, but my hunch is that Domaine de la Grande Courraye is not more than a name under which the wine from his vineyard in Castillon Côtes de Bordeaux is sold. The same probably applies to Château Langlais. East of St. Emilion and its 4 satellites, above the town of Castillon, lie the Côtes de Castillon and the Côtes de Francs AOCs. Côtes de Castillon is an appellation for red wines only. The dominant grape variety is Merlot (70%). Cabernet-Franc (20%) and Cabernet-Sauvignon (10%) account for the rest. Castillon Côtes de Bordeaux was recognized AOC only quite recently (1989). For a long time the wines of Castillon were only used as complementary alternatives to enhance Saint-Emilion blendings in poor years. Until 2009, these wines were sold as Cotes de Castillon. In 2009, the Cotes de Castillon appellation was merged with several other Bordeaux cotes to form the new Cotes de Bordeaux title. Castillon has risen from around 2,450 hectares in 1982 to 3,250 today. During the last 25 years or so, several growers of Saint-Emilion, Pomerol and other famous areas have recognized the Castillon Côtes de Bordeaux’s potential and invested in local vineyards. One of them is Stephan de Niepperg, who has acquired Château d'Aiguilhe. Ecocert is an inspection and certification body established in France in 1991. Ecocert has developed its own international network. With 23 offices and subsidiaries, Ecocert operates and offers its services in over 80 countries. We did not taste the wines of Gerard Dupuy this time, but will do so in September, when we will come back with the Weinfreundeskreis Hochheim. Pictures: The Wines of Chateau Beausejour (AOC Puisseguin-St.Emilion), Chateau Langlais (AOC Puisseguin-St. Emilion) and Domaines de la Grande Courraye (Castillon Cotes de Bordeaux). All Wines are Bio Wines, Certified by Ecocert. French organic vineyards doubled between 2007 and 2010 and then increased again 28 percent between 2009 and 2010 to reach 50,268 hectares, compared with a total of 860,000 hectares, accounting for 7 percent of the total. The Aquitaine region, around the Garonne river, is today the third largest in the country to experiment with organic vineyards, behind Languedoc-Roussillon and Provences-Alpes-Cote-D'azur, respectively in southwest and southern France. In Bordeaux, Chateau Guiraud in Sauternes - a 1855 classified producer - was recently approved to carry the organic label. This year, I caught up with him at finewine.com - a wine store in Gaithersburg, Maryland. Bill Holloran's story is: technology executive moves to Oregon to raise his family, starts to dabble in wine, hires one of the best young winemakers in Oregon (Jay Somers), buys a famous vineyard (Le Pavillon), and starts turning out classic Willamette Valley wines at high quality. Bill moved to Oregon in 1999. The winery is located at the northern end of the Willamette Valley, just south of Portland at 2636 SW Schaeffer Road in West Linn, Oregon. The Le Pavillon vineyard is located in the Dundee Hills AVA and is over 35 years old. The soil type is Jory, an ancient volcanic soil. The producing blocks are Pinot Noir, Riesling and Chardonnay. Farmed organically since 1999, biodynamically since 2005. The La Chenaie vineyard is located in the Eola-Amity Hills AVA. Pinot Noir, Tempranillo, Chardonnay and Riesling are planted on south, east, and southwest-facing slopes. Farmed organically. The estate Vineyard Meute de Chiens has 6 different clones of Pinot Noir. Farmed organically. Bill poured the following 5 wines, including his "Le Pavillon" Single Vineyard wines grown in the Dundee Hills with vines over 35 years old, farmed organically since 1999. This Pinot comes from 35 year-old vines in Holloran's Le Pavillon vineyard in the Dundee Hills. The vineyard has been farmed organically since 1999 and biodynamically since 2005. Ripe strawberry and cranberry aromas meld with spicy, licorice, cocoa,and cinnamon notes. Flavors follow the nose, and a big, rich, mouthfeel largely obscures the ripe tannin that will allow Le Pavillon to age gracefully. This is a go-to Pinot. It has aromas of beautiful strawberry and cherry and earth that lead to full red fruit and exotic spices on the palate. The tannins are light and the finish long, lingering, and full of lively fruit and spice. This will drink really well right now but has the depth of fruit and balance to develop for 3-4 years. This "single-vineyard" chardonnay exemplifies how low yields and hands-on management makes a wine that expresses the unique characteristics of the Willamette Valley terroir. The nose is dominated with aromas of apple and pear and the finish is crisp and mouth-watering. Full-bodied and luscious, it would be great with roasted chicken and other white meats. Serve this wine only slightly chilled to allow the fruit to come to the fore. Stafford Hill is the second label for Holloran Winery. Organically farmed, this vineyard produces wines that give an intensity rarely found in Oregon wines at this price point. Aromas of cherry, spice, and an appealing Willamette Valley earthiness give way to an elegant palate. A long, complex finish will leave you craving salmon, chicken kabobs and mushroom dishes. Even better after 30 minutes in the fridge! This Chardonnay is fermented and aged 100% in stainless steel, which gives it rich flavors and lovely balance. The second label of Holloran Vineyards, this is a blend of Holloran Le Pavillon and Willamette grapes, The addition of earlier-ripening Burgundian clones has given racier flavors to this traditionally produced wine. Perfect for the season, pair this lively Chardonnay with fish, Maryland crabs or enjoy as the perfect summer sipper for you and your guests! Two years ago I had the pleasure of participating in the production of one of Hendrik Thoma’s TVINO shows. He has now left TVINO and has started a new show – "Wein am Limit". Hendrik Thoma is a trained wine sommelier who has become a – as he calls it - Web 2.0 Sommelier. He launched in collaboration with the wine retailer giant HAWESKO the internet TV series TVINO about 2 years ago. With Hendrik, there were on average two shows per week. With the backing of HAWESKO, they were very professionally done and very entertaining. Hendrik typically did the show either by himself, reviewing a couple of wines, or with a guest, tasting the wines with him or her. The guests included such giant wine makers as the Antinori brothers from Italy, the German top wine maker H.O. Spanier from the Battenfeld Spanier Estate in Rheinhessen, and the French actor and super star Gerard Depardieu, who also produces wine. The TVINO show in which I participated was the first TVINO Late Night Show, produced in Hamburg’s red light district. It had very illustrious guests: a famous German travestite actor, a star sommelier from Berlin, and the owner of Hamburg’s top restaurant Old Commercial Room, who grew up in the red light district. 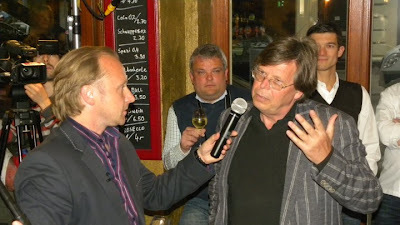 At the same time as leaving TVINO, Hendrik has launched his new internet video show – Wein am Limit (Wine at the Limit). In contrast to TVINO, Wein am Limit is not backed by a financially strong wine retailer. But over the years, Hendrik has made a name for himself so that I am not worried about the future of Wein am Limit. Hendrik speaks English – in fact, he met his Trinidad and Tobago born wife while he was working in California and he is well connected in the international wine world. I hope he will give his show an international touch. All the best Hendrik. “Wein am Limit ist ein unabhängiger interaktiver Video-Wein-Blog mit dem erklärten Ziel, das Weintrinken nicht zu einer olympischen Disziplin für bornierte Snobs, Besserwisser und Fachidioten werden zu lassen. Im Gegenteil – dieser Blog ist die beste Möglichkeit für Nichtprofis wie Profis einen authentischen Blick auf die Weinbranche zu werfen. Bei Wein am Limit wird aufgeräumt mit Weinlatein, Halbwissen und einer lebensfernen Welt. Niemand, der sich hier engagiert, soll vor verschlossenen Türen stehen. Wein war und ist immer ein Geschäft, das von persönlichen Beziehungen lebt. So soll es bleiben. Wir sehen uns ganz in dieser Tradition. I attended a winemaker dinner at Michael Pearce’s Wine House in Fairfax in Northern Virginia, where Nice Legs owner Al McCosh had brought along owner winemaker Christian P. Berg from Oregon, who presented his wines, including his Klee wine. The dinner was $ 75 per person / $65 wine club members. Born in Racine, Wisconsin and raised in Idaho, Pennsylvania and Illinois, winemaker and winegrower Chris Berg didn't always know he wanted to make wine. In fact, when he graduated from the University of Kansas in Lawrence with a bachelor's in English, he wasn't sure what his future held, as far as a career. Meanwhile his parents had decided to relocate to Oregon from Illinois with the purchase of a manufacturing company in Tualatin. Chris soon followed and helped his parents at the plant, as well as the other reason for the big move: planting a small vineyard. In 1999, the Bergs planted seven acres of mostly Pinot Noir on the 20-acre property near Yamhill in the Yamhill-Carlton District of the Willamette Valley. Chris’ parents Chuck and Dian built a small house on the vineyard, and Chris lived in Portland with his wife, Hilary, also a Jayhawk. The family's business closed their doors in 2000 and the Bergs found themselves full-time winery folk. In 2001, Chris’ parents moved to Arizona and Chris and Hilary were then given the opportunity to move to the vineyard from Portland. In 2002, the Bergs picked their first harvest of a whopping three tons, which were made into 72 cases of Pinot Noir. In 2003, overall production was increased to 250 cases. In this same year, Roots introduced its reserve bottling, called Racine. In 2004 Chris launched the third label, Klee, which pays homage to Bauhaus artist-in-residence Paul Klee. For the 2005 vintage, Chris also decided to purchase wine grapes other vineyards. In all, 550 cases were produced for the three labels: Roots, Racine and Klee. Over the following 4 years, production increased to 4000 cases. Also, a fourth label was added - the Black Light label for wines made from Washington State fruit. I did not meet Hilary. “I make the wine, but Hilary tells me what she likes. Hilary designs the labels and runs the social media activities. As editor of Oregon Wine Press, a well respected monthly based in McMinnville, Hilary sits at the center of the wine industry.” Chris said. Chris’ wine making philosophy is very much grounded in the natural wine approach. The idea behind natural wine is non-intervention and a respect for Mother Nature. Natural wines are hands-off wines produced with as little intervention as possible. Typically, only natural yeasts are used, the fermentation is slow, there is little or no use of new oak barrels; and there are no filtrations or cold stabilization. Commercial yeasts are one of the great culprits in today’s homogenization of wine, imparting their own aromas over those of the grape. Chris apprenticed with Lynn Penner Ash during her last year at Rex Hill, with Eric Hamacher of Hamacher Wines, and at Archery Summit. He also worked as a sales person for German wine and I was very surprised about his deep knowledge of the German wine scene. Estate Vineyard - Roots Vineyard: 6.5 acres Pinot Noir. Planted in 1999 and 2000, our estate vineyard is located northeast of Yamhill in the Yamhill-Carlton District. All fruit is organically grown. “We live there” said Chris. Cherry Grove Vineyard: 2 acres Pinot Noir. Just northwest of Gaston in the coastal foothills of the Willamette Valley AVA. Apolloni Vineyard: 1.8 acres Pinot Noir. Deep in the foothills of the coastal range this vineyard in nestled outside of Banks in the northern most part of the Willamette Valley AVA. Leroy Vineyard: 3 acres Pinot Noir. This 35-year-old vineyard sits on the far northeast side of the Chehalem Mountain AVA, close to Hillsboro. 49 Rows Vineyard: 3 acres of Pinot Noir. This young vineyard is near Willsonville on the southeastern edge of the Chehalem Mountain AVA. Seven HIlls Vineyard, Walla Walla AVA; Pepper Bridge Vineyard, Walla Walla AVA; La Colline Vineyard, Walla Walla AVA; Mirage Vineyard, Columbia Valley AVA; Outlook Vineyard, Columbia Valley AVA. The Roots Wine Company has four wines in its portfolio. The “Roots” line wines are all single-vineyard wines, including from the estate vineyard, both red and white. The “Racine” line wines are “the upper terrace wines that is a selection of the best of the vintage,” said Chris. Racine, the French word for root, is Chris Berg's own birthplace. The bottles are even stamped with his birth date (June 29, 1970). The “Black Light” is a fun line of red wines made from Washington State grapes. With a label that is a homage to the Grateful Dead, Chris and Hilary's playful side comes out. The labels glow in the dark. When I was a child I remember, I had a Paul Klee print in my room. Paul Klee was born in Switzerland in 1879. He studied art at the Munich Academy of Fine Art (1898-1901) and later became associated with the Blaue Reiter group. Artists in the group believed that they had a responsibility to "heal the gaping wound that separates man from his environment". Later Klee taught at the Bauhaus in Weimar and Dessau. With the emergence of Adolf Hitler and the Nazi Party in Germany, Klee returned to Switzerland. A large number of his paintings on display in Germany were confiscated by the Nazis as degenerate. Paul Klee died in Switzerland in 1940. The Wine House is a wine store and a wine bistro at the same time. It offers a bistro-style dining experience paired with a large selection of wines from all over the world. I find the atmosphere very appealing – relaxed, sophisticated, and modern. The wine selection is excellent. You buy by the glass or bottle. When you buy a bottle, owner Michael Pearce explained how it works: “Our wine list is our retail store. Simply pick a bottle off the wine rack at retail price and open it at your table for a $ 10 corking fee. For those of us that enjoy dining out, we know what great value it is to pay retail price versus restaurant mark-ups”. I like this concept very much. This was a very intimate winemaker dinner. We were all sitting around a communal table – about 12 of us – and talking with the up and coming winemaker Chris P. Berg, tasting his wines and enjoying the wonderful Wine House menu. Al Mcosh, the owner of Nice Legs, joined the conversation as did Michael Pearce. Light salmon in the glass, hints of peach, pear skin and eastern spices on the nose, really aromatic, the palate is dry but fresh and vibrant, fairly long finish. I was in particular interested in the wine, after having attended the first Oregon Pinot Gris Symposium last year." Oregon Pinot Gris Symposium at Oak Knoll Winery in Hillsboro"
Klee Pinot Noir is Chris Berg's (mostly) negoce Pinot Noir made from five Oregon vineyards he works with. Rose petals in the glass, notes of black cherry, ripe red fruits and brown spice on the nose, good structure, cranberry, orange peel and clove on the palate, a generous Oregon Pinot Noir. Dark red in the glass, notes of cherries, wood smoke and Asian spices on the nose, concentrated, elegant wine, amazing silkiness on the palate, a 93/94 points wine. "2008 was a glorius vintage. The wine is starting to give up its fruits, it is a rich wine. it is what the vintage and the vineyard gave us. All I do is to try not to screw it up." said Chris. This wine will clearly improve further over the next couple of years. Tarara Winery is in Loudoun County, about an hour by car from Washington DC. The beautifully manicured 475 acre farm stretches along the Potomac River. Founded in 1989 by RJ (Whitie) and Margaret Hubert, Tarara is home to some of Virginia’s finest wines. Annual production is 10.000 cases. Last week, the gorgeous pear trees on the property bordering the road were in full bloom. A raised deck just outside the tasting room provides nice views of the Potomac River, back dropped by the Sugar Loaf Mountains in the distance. Tarara has free outdoor concerts every Saturday on the outdoor deck in the summer. Tarara’s main vineyards are Nevaeh (the estate vineyard managed by Ben Renshaw), Tranquility (in Purcellville, also managed by Ben Renshaw), Honah Lee (in Orange managed by Wayne and Vera Preddy), Mountainview (in Roanoke County managed by Megan and Andy Seibel), and Indian Springs (in the Winchester area managed by Steven Brown). Nevaeh is made up of three distinct blocks – The Hill, The Road and The Pond. The Hill has the deepest soils made up of red clay with limestone deposits cutting through the block. The varieties planted on the Hill and used for Tarara bottlings include: Chardonnay, Cabernet Franc, Cabernet Sauvignon, Merlot, Syrah, Viognier and Petit Manseng. The Road is the flattest of the sights and furthest from the Potomac River. Varieties planted and used for Tarara bottlings: Syrah, Cabernet Sauvignon, and Merlot. The Pond is the coolest site of Nevaeh. This block is the best for Tarara’s aromatic whites like Viognier, but is also home to some of Tarara’s most elegant Merlot due to the length of the growing season it can have and small amounts of Grenache and Mourvedre. Tranquility Vineyard is a seven acre vineyard planted in 1999 by it's owners: Al and Mary Taylor, set in the rolling hills of the Virginia Piedmont. Starting with the 2011 season, the Tranquility Vineyard is being leased entirely by Tarara Winery. Tarara only bottles wine using the Cabernet Sauvignon and Tannat. Honah Lee Vineyard is a very steep South-West facing slope at about 1000 feet elevation. The wines from Honah Lee tend to be the most “exotic” of the wines produced at Tarara with soft structures and lovely rich ripe fruit. Honah Lee grows the following varieties for Tarara: Viognier, Petit Manseng, Roussanne, Chardonnay, Petit Verdot, Tannat and Pinotage. Jordan Harris – this became more than clear during the tasting – is very passionate about the natural wine concepts. The idea behind the winemaking at Tarara Winery is to take a minimalist approach to allow the vineyards to best express themselves. Jordan believes that fine wines are made in the vineyard. Every time they have to get in the way of the wine, it is less of an expression of that vineyard. The Tarara wines are made in a 6000 square foot cave – which we did not visit, but I could look at the cave from the tasting area - to allow nature to give the winemaker consistent cellar temperatures and perfect humidity. This allows the wine to age gracefully in predominately Virginia Oak barrels until the wine is ready for bottling and eventual release. Jordan grew up in a little village in Canada, an hour north of Toronto. He went to a Culinary School and became the manager of a fine Italian restaurant. He left the restaurant and went back to school for Oenology and Viticulture at Niagara College. Before moving on to Virginia, he made wine in the Niagara region of Ontario, Canada, where he worked for a few wineries. He made a lot of Icewine, in one country more Icewine alone then Virginia produces wine in a year. Jordan shares the winemaker job with his Canadian compatriot Jonathan Boyle. The Tarara wine portfolio currently comprises the following wines. All blends of Nevaeh, Mountainview and Indian Springs vineyards. All barrel fermented and aged in Jupilles forest oak (10 months, 85% New). Indigenous yeast. Tarara’s flagship wine. This is a steal. Pricewise, it is an entry level wine, but from the quality it should be at a different price point. In fact, the grapes were not harvest with this wine in mind but for higher quality wines. But Tarara wanted to start the Boneyard series (Red and White) and therefore decided to utilize higher quality wine that was available. The wine is approachable and drinkable now, but will also do well with some more age. 18 months in Virginia Oak. Indigenous yeast. Unfined and unfiltered. Cabernet Franc – one of the 3 Bordeaux grapes, but the one which has not been able to succeed on its own feet, like the Cabernet Sauvignon and the Merlot. The 2007 was Jordan’s favorite wine. “Has perhaps another 2 years to get to the peak”. Has meaty leatheriness, certainly past its prime, no fruit anymore, but still decent tannins. Honey, pinapple. Interestingly, as Jason pointed out, this is not a noble-sweet wine. The grapes had plenty of sugar without being frozen (icewine) or rotten (Botrytize) so when the fermentation stopped at 15.4% alcohol, there still was quite a bit of unfermented sugar.